What franchise in the history of Major League Baseball has four twenty game winners in one season? The 1971 Baltimore Orioles. 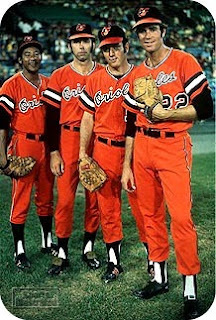 In 71, Mike Cuellar, Pat Dobson, and Jim Palmer had 20 wins, while Dave McNally had 21.. Those Orioles would finish with a 101-57 record. However they would fail to win a second straight World Series as they lost to the Pittsburgh Pirates in seven games. The Orioles would the World Series in 77, and 83 and have not won any since. In 96 and 97, the Orioles brought magic back to Baltimore as they reached the playoffs for the first time since 1983. However they lost in the American League Championship Series both years in six games. The Orioles have not had a winning season since. In August 2010 the Orioles hired Buck Showalter as the manager. After a 2-14 start, they finished the season strong under Showalter with a 34-24 record between the months of August, September, and October. Fans in Baltimore could not wait until the 2011 season. However, the disappointment would strike again. The Orioles finished 69-93. But if it was one thing that gave them hope for 2012, it was the fact that they prevented the Boston Red Sox from reaching the post season as they defeated them 4-3, and within minutes, Tampa Bay Rays' Evan Longoria hit a game winning home run against the New York Yankees and the Rays allowing them to secure the wild card slot. Experts call this the greatest day in baseball history. As the 2012 season approached, fans in Baltimore were optimistic. Fresh off the heart breaking lost by the Ravens in the AFC Championship Series, they were just hoping for a season above .500. They knew that with a manager luck Showalter, losing seasons would not continue every year, but when would the turn around come was the question. Showalter, a respected manager in the league, was responsible for putting together the World Series Championship teams in New York (Yankees) and Arizona, and a dominating Texas Rangers team in the early 90s. While "Buck" was putting these teams together, he was always replaced, and then a new manager would come in and win the World Series with them. The Orioles have showed promise this season. Currently sitting in 1st place with a record of 28-16, the Orioles are the most powerful team in the majors leading everyone with 65 team home runs. Adam Jones leads the team with 15 and is 3rd in the American League. Orioles baseball has not been this exciting since 97, when the team went wire to wire in first place all season. This year, they have had their share of battles, including a 17 inning win over the rival Red Sox. In this game, both teams used a position player to pitch after using everyone in their bullpen. For the Orioles it was Chris Davis who was 0-7 at the plate scoring the victory, including striking out Adrian Gonzalez. The Orioles would finish that series with a sweep over the Red Sox in Boston for the first time since 94. The 2012 Orioles are road warriors. Currently they have a league best 15-6 record on the road which includes series victories over the Red Sox, Yankees, Toronto Blue Jays, Kansas City Royals and Washington Nationals. Many of these wins are credited to their bullpen who has a league best 19 saves. A year ago, when it was time to call the bullpen, fans knew that the game was in trouble. Everyone says that the Orioles start this way every year, but the magic in Baltimore says other wise as the Os are getting it done with their bats and on the mound. How sweet will it be if the Orioles and the Ravens are both playing in October. While it is too early to tell, fans have a reason to be excited about baseball once again in Baltimore.